Leicester’s city centre was brought to life last night after the Christmas lights were turned on marking the start of the festive period. 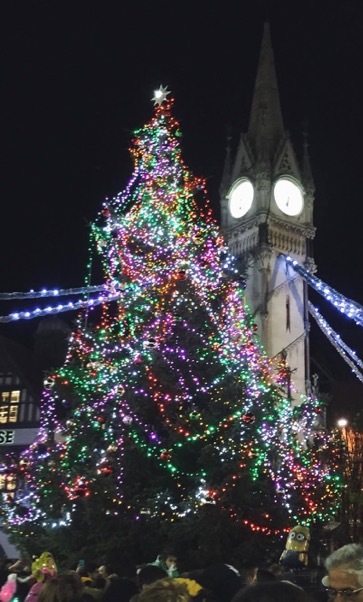 Lord Mayor, Stephen Corrall, was given the responsibility of turning on the lights during an evening of live entertainment for the hundreds that attended. Joe Toay, 20, said: “The Christmas lights being switched on is always a good evening to come into town and feel part of the wider community. The evening was filled with great live acts to support the switch on staged outside Humberstone Gate. Sam Bailey performed on stage in front of fans under the newly lit Christmas Tree singing a mixture of her own material and classic Christmas hits. The X Factor winner was supported by a wide range of acts including the Studio 79 dancers, Bullfrog Arts Fostering Voices Choir, Le Bella Ukulele, De Montfort Hall pantomime cast, the Curve cast from Grease and Johnny and the Goodtime Boys. Daphne Dobson, 81, said: “It’s so lovely to see so many people supporting the switching on of the city’s Christmas lights and having a good time with their friends and families. “I think it’s so important that we have nights like this where the whole city and neighbourhoods come together to celebrate. Other activities were taking place throughout the city to celebrate the start of the run up to Christmas. Stars from the local production of Jack and the Beanstalk had a meet and greet outside the Visit Leicester building handing out goody bags to all that came to see them. Snowtopia took over St Peter’s Square with stilt walkers and a neon show transforming Highcross into a winter wonderland. Finally, the Leicestershire Fire and Rescue team brought Rudolph to the town centre where anyone could sit on Father Christmas’ sleigh and have a picture. To see more events being organised by Leicester City Council over the Christmas period please visit –http://www.leicester.gov.uk/.